Pulsar at the Galactic Center? A pulsar may lie just one light-year from the heart of our Galaxy, say astronomers using the orbiting Chandra x-ray observatory. The pulsar seems to have been shot out of a cluster of stars near the Galactic center. At the Milky Way's center is a black hole named Sagittarius A*, which is 3 million times more massive than the Sun. The black hole is 27,000 light-years from the Sun, which orbits it every 230 million years. Surrounding the black hole are many young, high-mass stars. When these stars explode as supernovae, they should leave behind pulsars and black holes. A pulsar is a rapidly rotating neutron star that emits radiation in a beam. As this beam sweeps past Earth, astronomers detect a pulse of radiation, usually at radio wavelengths. But the gas around the Galactic center is so turbulent that it smears out radio signals from any pulsars there. Now Q. Daniel Wang and Fangjun Lu of the University of Massachusetts at Amherst and Eric Gotthelf of Columbia University have discovered a cucumber-shaped nebula near Sagittarius A* that emits x-rays. This nebula "probably represents the most convincing case for the presence of a young pulsar in the [Galactic center]," the astronomers write. In particular, the nebula's shape and spectrum resemble those of pulsar-wind nebulae, which form when pulsars race through interstellar gas. 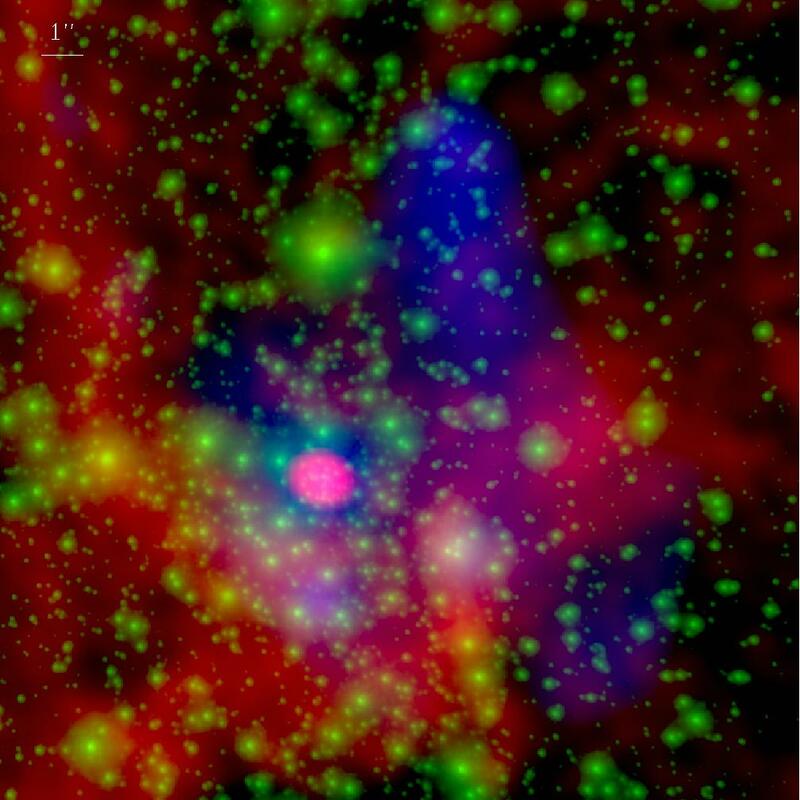 In this false-color image, radio waves are colored red, near-infrared light is colored green, and x-rays are colored blue; north is up and east is to the left. Sagittarius A*--the Galactic center--appears as a pink dot. The proposed pulsar-wind nebula, named G359.95-0.04, is the elongated deep blue object to the upper right of Sagittarius A*. It is oriented north-south. The nebula is about 2 arcseconds wide and 8 arcseconds long. One arcsecond is 1/3600 of a degree--the apparent diameter of a dime viewed from two miles away. The astronomers think the pulsar lies near the nebula's northern tip, just 8.7 arcseconds north-northwest of the Galactic center. The projected distance between the pulsar and the Galactic center is only one light-year. In other words, if the two objects are equally distant from us, then the separation between them is just one light-year. However, if the pulsar is closer or farther from Earth than the Galactic center is, then the pulsar lies farther than one light-year from the Galaxy's center. "This object is almost certainly a pulsar," says Dale Frail, a radio astronomer at the Very Large Array in Socorro, New Mexico, who was not part of the discovery team. Frail says the most convincing evidence is how the spectrum of the nebula's gas changes with distance from the pulsar. The pulsar injects energy into the gas, causing electrons to emit so-called synchrotron radiation as they spiral around magnetic field lines. When the pulsar moves on, the electrons lose energy, changing the spectrum in just the way that Wang and his colleagues have observed. Frail hopes that someday astronomers will be able to trace the paths of pulsars around Sagittarius A*. "By their very nature, pulsars are very accurate clocks," says Frail, "and if we could get a clock around a black hole--meaning Sagittarius A*-- that's free tickets to Sweden." Such observations would test Einstein's general theory of relativity in a region of space having strong gravity. Furthermore, theorists predict that hundreds of neutron stars exist within a few arcseconds of Sagittarius A*. Astronomers have already traced the orbits of more ordinary stars around Sagittarius A*, allowing them to weigh the black hole. Recently, a team led by Sangwook Park of Pennsylvania State University discovered a possible pulsar at a projected distance of 16 light-years from the Galactic center. This pulsar resides near a supernova remnant known as Sagittarius A East. Other astronomers have suggested that IRS 13 is the core of a star cluster bearing a black hole much smaller than Sagittarius A*. Wang's team speculates that the pulsar may have passed close to this smaller black hole and been shot out of the cluster as a result. The astronomers also say the pulsar may account for previously detected very-high-energy gamma rays that emerge from the Galactic center. To prove the existence of the pulsar, Wang and his colleagues say astronomers should look for periodic pulses from the object. The astronomers will publish their discovery in Monthly Notices of the Royal Astronomical Society.